Meet Ned, Nora and Nicky, the Narwhal family! I'm picking things up on the critter blocks right where I left off when I became ill. Although the first few blocks came out in 2013 and one block in 2014, the complete set of 12 blocks will be called the 2017 set of Sundrop Critters. 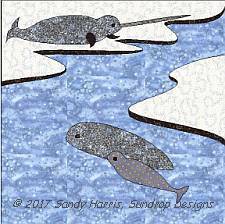 You can download a free pdf pattern for the narwhals on my website www.sundropdesigns.net until March 15. After March 15, the pattern will be available for purchase only. Adult male narwhals have a large, overgrown left canine tooth that grows through the upper lip into a long tusk. This tusk has earned them the nickname "unicorn of the sea." About 15% of adult females also grow a tusk. Very rarely (like 1 in 500), an adult male will grow two tusks with the right one being shorter than the left. 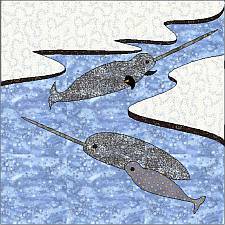 Unlike other animals that grow tusks, the narwhals tusks are spiral like a screw and have sensory receptors on the outside. Alternate layout. The same tusk pattern can be used for the female narwhal.